Warning! 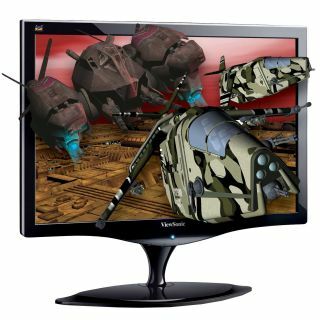 ViewSonic 3D monitors may open portals to invading space hordes! ViewSonic today launched a range of 120Hz LCD monitors that are ready to deliver 3D gaming and movies. The bizarrely capitalised FuHzion screens will, apparently, "make 3D standard in the home". Don't get too excited, though, they still require you to wear clunky (and expensive) 3D specs, such as those made by Nvidia. Top of the range is the VX2268wm, a 22-inch desktop monitor with 1680x1050-pixel resolution, 20,000:1 dynamic contrast ratio, 2W stereo speakers offering SRS WOW fake surround sound and 300cd/m2 brightness. The screen has a 2ms response time, making it suitable for high-speed gaming. 3D gaming comes into play with the new NVIDIA GeForce 3D Vision stereoscopic active shutter glasses for the home (£130). The NVIDIA GeForce 3D Vision glasses are compatible with more than 350 existing entertainment titles. The VX2268wm has a DVI-D DualLink interface and is available now, priced around £270.